When I was a kid I can remember sitting at the table many hours in front of food I didn’t want to eat; peas, lima beans, and Brussels sprouts. Hours. Thank goodness for Daisy the dog. Parents stepped out of the kitchen and that food went straight into that sweet little dog’s mouth. I still don’t like peas and I detest lima beans, but I was willing to give this recipe a try. Mainly, because I saw this beautiful butternut squash and I bought it thinking I don’t know what the hell I’m going to do with this but knew I’d figure it out. After perusing many recipes I came across Yummly.com. Great site ~ I highly recommend. It was surprisingly easy to make. A little time-consuming because you have to peel the squash, but other than that not bad at all. The tartness of the granny smith apples offset the bitterness of Brussels sprouts and the candied walnuts added a flavorful texture to the dish. 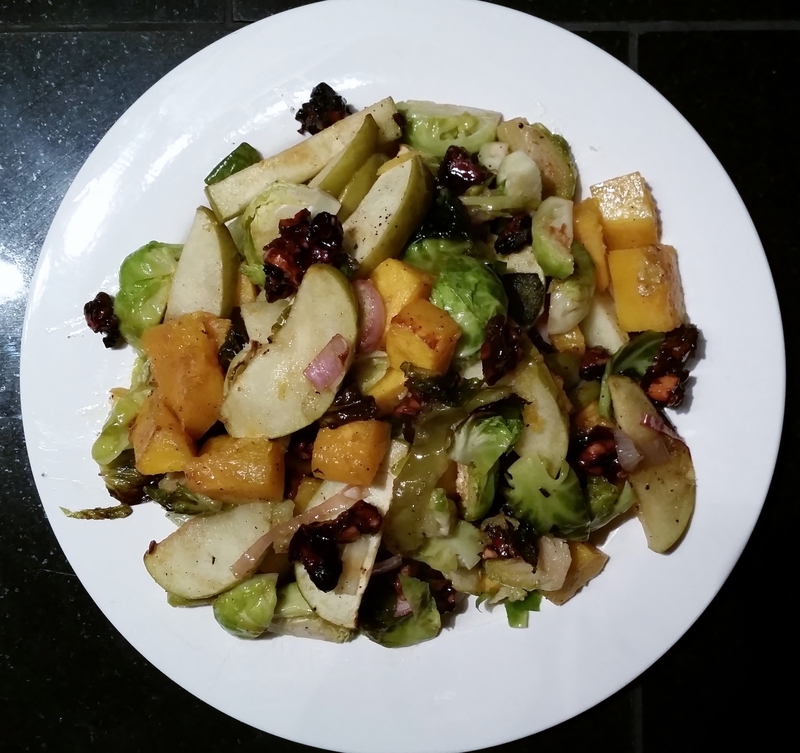 Find the full recipe here: The Occasional Vegetarian’s Roasted Brussels Sprouts, Butternut Squash and Apple with Candied Walnuts. This entry was posted in August ~ 2014, Eat and tagged Health, vegetarian. Bookmark the permalink.